This shouldn’t come as a surprise to anyone familiar with the blog. 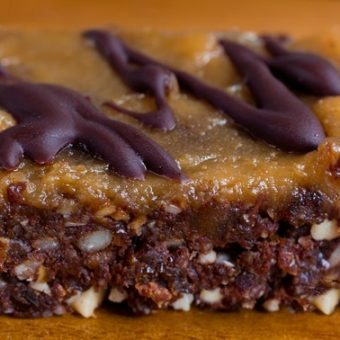 There’s an entire page devoted to this type of recipe: Over 100 healthy dessert recipes that can be made in 5 minutes or less. 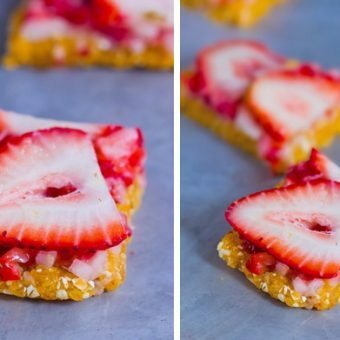 So these chocolate strawberry bars are perfect for me: Just a few ingredients, and the recipe can be made in—you guessed it!—under 5 minutes. 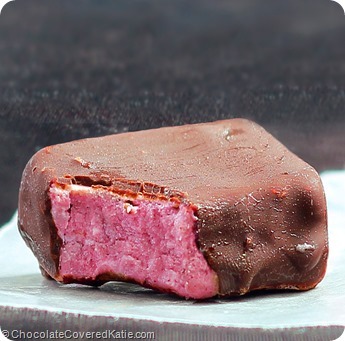 They kind of remind me of Strawberry Klondike Bars… just more like fudge in the middle than ice cream. First blend just the berries in a blender or food processor until smooth. Add the salt, cinnamon, coconut butter, and sweetener, and blend again until smooth. Smooth into a plastic container, and freeze until firm. 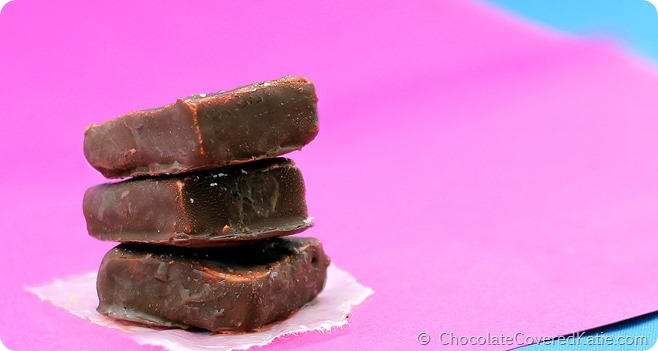 Cut into bars or bites, and return to the freezer. (You can even insert popsicle sticks if desired.) 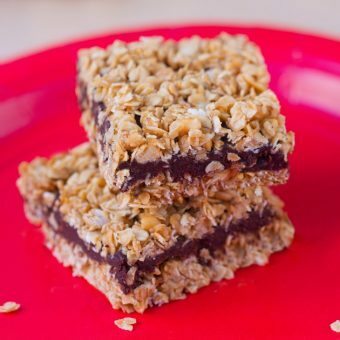 You can either eat these bars plain OR cover them in melted chocolate chips or the following chocolate coating: Mix together equal parts cocoa powder, virgin coconut oil, and pure maple syrup until a thin sauce forms. Dip in the strawberry fudge, then immediately set back in the freezer to harden. Leftovers should be stored in the freezer for up to two weeks. I’m working on a personal post I’ve been thinking about publishing for a while now… some of you can probably already guess the topic. Hopefully it will be up next! If you’re only interested in reading recipes, please rest assured they aren’t going anywhere. I’m also starting to plan the recipe theme weeks! So if you have any particular theme weeks you’d like to see, feel free to leave requests in the comments. It’s early, but did I miss the step where you mix in the coconut butter? I’m assuming it’s right after you blend the berries and add the other ingredients, but wasn’t sure. Looks yummy! Might need to whip these up today! Looking forward to reading the personal post soon. oh my goodness YUM! 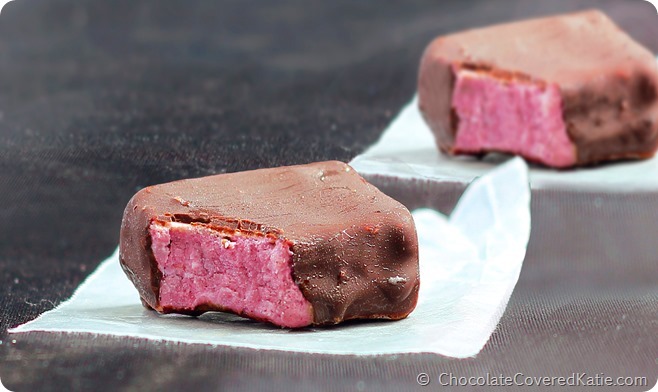 I have a batch of the raspberry version of this fudge in my freezer now. can’t wait to try it with strawbs! Hi Katie, do you usually make your own coconut butter or buy it? I’ve looked for it at a few places, including Trader Joe’s, but I’ve only found coconut oil. Do you have any suggestions for where to find inexpensive coconut butter or a recipe for how to make it? Thanks! I tried to make it once with raw coconut flakes, but it didn’t turn into anything resembling butter. I used a high powered blender – maybe a food processor would work better. It’s super easy. If you have a food processor or a blender just take a bag of unsweetened coconut flakes or shreds, empty the bag or half the bag (depending on how much you want) of unsweetened coconut into the blender or food processor turn on said machine and it will whip the coconut into a beautiful yummy butter! If you want you can scrape down the sides of the blender or food processor periodically. I found some last week at Wegman’s in Rochester, N.Y. in the natural food section (Nutiva Coconut Manna). I wouldn’t call it inexpensive, though! It was $7.49 for 15 ounces. I used it to make some Light Summer Berry Yogurt Pies for our 4th of July picnic! I have actually just seen it at walmart before. They carry coconut butter. You can get wonderful coconut butter from Tropical Traditions online. This looks great! I might try this with the black raspberries I just picked from our yard, but I’m wondering if the seeds might too much. I’d like to request a recipe for a vegan soufflé please! I’ve never tried one before. They look pretty and sound yummy 🙂 Strawberry lover’s delight. Thanks for another easy idea! I’m looking forward to learn more about you personally, too. These sound so simple and quick! You can just whip some up and then get out to enjoy the sunshine. I cant believe you turned my favorite ice cream treat (klondike bars) into something I can enjoy without feeling guilty about it. Once again you’ve made something that makes me want to leave my desk and head to the grocery store, immediately! FYI, I do enjoy your personal posts as much as your recipes; it’s always good to see the personality and story behind the work you do here. P.S. 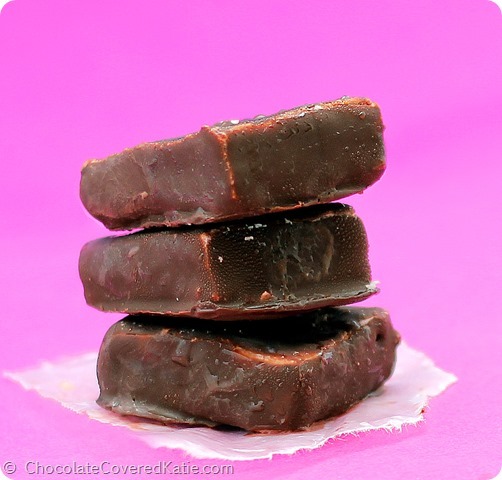 For a copycat Klondike recipe, might I recommend that you replicate the mint version? Or even better, the “Reese’s” Peanut Butter Klondike? Looking forward to your personal post. I hope everything is ok.
Oh yes, all is okay!! Looks so fresh and delicious! I want to steal some:) And as for me – I do like the way you writing and that sometimes you post not only recipes – for me it’s more about the person behind the scene and I’m glad to meet this person. These look amazing! 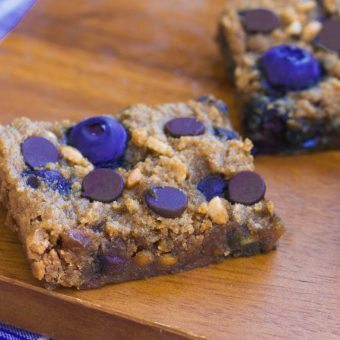 I have it on my to-do list to browse your recipes and make some this weekend 🙂 especially after my sweet tooth this week! I would love to read your post! It’s always nice to “know” the people you follow a bit ya know? Noooooooo! Please, please go back to having the entire post included in the email! My “filter” at work blocks any “social-media-related sites” (I teach high school) and it keeps the full pages from popping up whenever you click on the title of the link. Drives me nuts– please, please, pretty pretty PLEASE !!!! Wish granted. It was fixed almost immediately after I got this morning’s email. I had changed some settings the day before but never intended for the emails to have been changed.